In honor of the upcoming arrival of All Hallows Eve, or Halloween as is the most common name, I am going to be taking a closer look at one of my Elsewhere themed Batman figures, notably the scariest looking one of the lot, Vampire Batman. Released by Mattel for the Batman Unlimited action figure line this figure is based on the story line Batman & Dracula: Red Rain in which Batman voluntarily becomes a member of the undead in order to properly fight vampires that were attacking Gotham City and most notably take on Dracula himself. I am a big fan of the concept of Batman in different time periods and concepts which is the staple for the Elseworlds storylines and subsequent themed toys, so while I am not a huge vampire fan this fits into the first criteria so it is a very cool figure to take a deep dive look at for me. Between the wings, fangs, red eyes, thinner/gaunt look of his body I would say this represents well what you would expect to see from a Vampire Batman. Starting with his vampire wings, they really put the focus on the fact that you aren’t looking at just another Batman figure. The wings give this ready for flight at any moment and not giving the vibe that this was not something manufactured at Wayne Enterprises to help Bruce take flight, the wings definitely have the organic living vampire bat type look. This figure also depicts what looks like a gaunt feel than my other Batman figures, as I would suspect if you were to become an undead vampire than you may have to not worry about excess body fat. J There is still some good muscle definition on this Batman figure but in my eye we see more of an elongated or thinner version of Batman. One of the aspects about this figure that I am not usually a fan of is the very long ear pieces protruding from Batman’s cowl. When this is depicted in the comics I am not a fan at all. I just don’t understand how having antennas sticking that far up from a very tall man that is Bruce Wayne would be conducive to stealth and helping his fighting ability. If I was fighting him it would give me something to grab a hold of and given the right strength be able to swing him around like Hulk does to Loki in the Avengers movie. For the sake of this figure it oddly works because it gives a more vampire-ish look to the figure so I am much more tolerant of the “rabbit” ears for this version of Batman. This figure also comes with a blood red crucifix stake in the shape of the Batman logo. This piece is very cool other than on mine it was a very loose grip and seldom fell off. In fact at this moment, I have misplaced that accessory which is a complete bummer for the sake of this writing and pics that I am posting. However, if you get this figure and have a method to make him hold the stake with a better kung fu grip than I did or would like to donate the accessory to my collection I would love to hear from you. 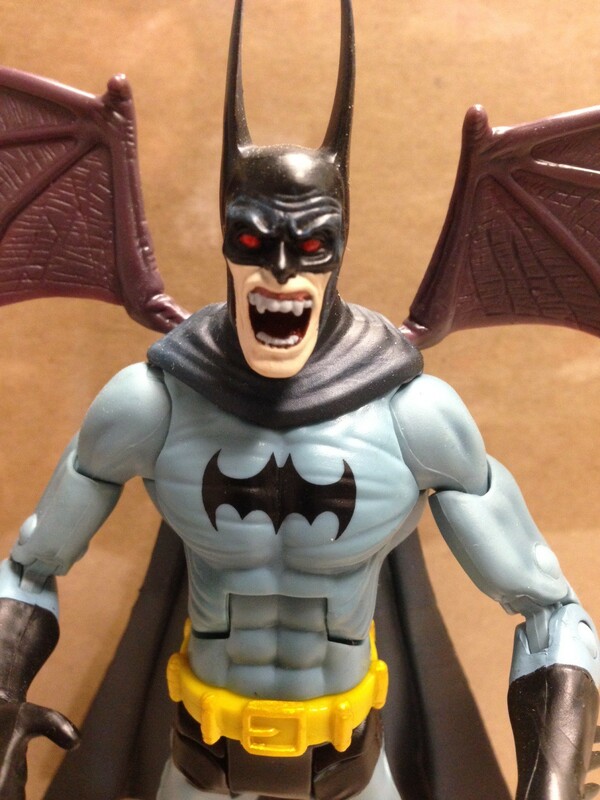 Taking a closer look at Vampire Batman’s nightmarish face, I just don’t have anything to hate about it. Well defined fangs, ghoulish open mouth, and blood red eyes. 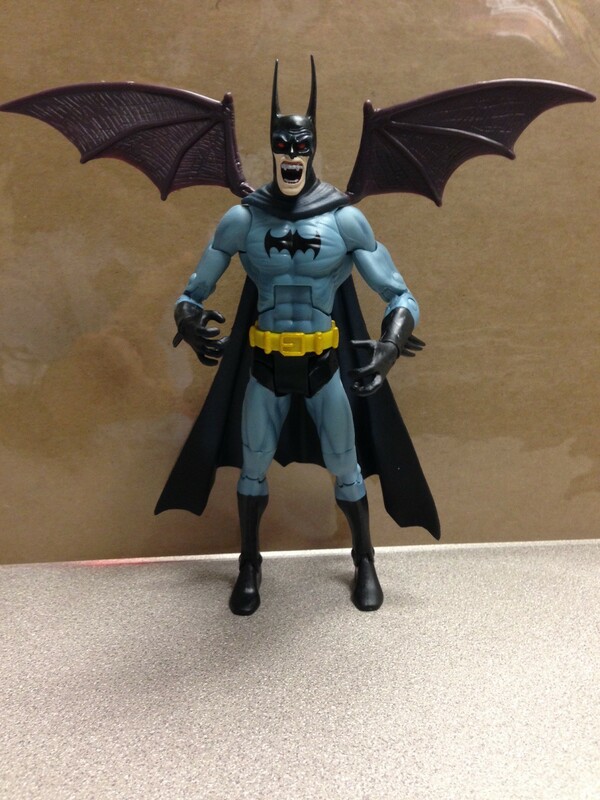 This most definitely is a great Halloween type figure for Batman and Vampire fans alike. I recommend for all ghouls and goblins provided they have a high tolerance for freaky looking things that may come alive and go bump in the night while they sleep off their sugar induced coma on Halloween. A plethora of ways to follow or contact me, feel free to reach out or see what I am up to next. Posted on October 24, 2014 by The Southgates and filed under Uncategorized and tagged batman dracula elseworlds vampire.